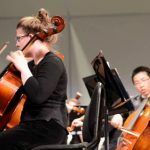 The purpose of the Utah Valley Youth Symphony Organization is to support the aesthetic, social, and intellectual development of our youth and community through music. The Utah Valley Youth Symphony Orchestra, Inc., is a self-funding, non-profit, tax-exempt corporation, designed to “offer young musicians opportunity for study, performance, and creation of music on a potentially professional level,” and to “foster appreciation and study of standard orchestral repertoire.” The UVYSO Corporation has an Executive Board, an Advisory Board and a Volunteer Guild. The Utah Valley Youth Symphony Orchestra, founded in 1960, is a private, auditioned organization comprised of the finest youth musicians in Utah Valley, an area located 40 miles south of Salt Lake City of approximately 320,000 population. Three different youth orchestras composed of talented students from area schools rehearse weekly and perform numerous concerts after passing very competitive auditions. Because these outstanding young musicians must compete for membership, only those of the finest talent and character are admitted for membership. Student musicians study and perform the highest quality music from all stylistic periods under the very capable direction of the artistic staff. The principal conductors are Britton Davis and David Beck assisted by Brent Taylor. The groups rehearse weekly between September and April. In the total music education program of the Utah Valley Youth Symphony Organization, more than 250 student musicians ages 10 through 21 perform in three orchestras. Touring is an important focus of the organization, and tour fees are paid by participating members of the touring groups. The Touring Orchestra of the Organization has performed throughout the Western United States, including Hawaii, and boasts three prestigious performances in New York City’s Carnegie Hall with repeated invitations to return. International tours include five different trips to London, plus Continental Europe, Russia, Mexico, and Brazil, always to enthusiastic audiences. Hello, this is James Durfee (one of your percussionists) informing you that I will not be able to attend the group from now on.